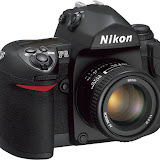 The F6 handles very similar to the D300. Without the add-on grip, it is similar to the D300 in size, but feels heavier. The grip is thicker, and with my fingers, is a better fit than the D300. From a size perspective, without the grip its height is similar to that of F100. Due to its weight and metal back, it feels more solid in the hand. With the MB-40 battery pack attached, the F6 has the same height as the F3 with the MD-4 motor drive. I am very fond of the F3/MD-4 combination, which I think feels superb in the hand. The F6 is better in that the fingers naturally fall on the dials which allow the shutter speed/aperture to be changed without having to move your hand from the grip. With the F3, the shutter dial is further away, and to change speeds, you have to take your hands off the grip. Nikon makes a lot of noise in its sales literature about how quiet the F6 is. Compared to a film SLR it is quieter, and the film advance is nearly silent. But overall it sounds very much like the D300. I assume that all the refinement in the F6 made its way into the D3/D300 cameras, therefore, for anyone used to these cameras, the F6 sounds similar. The quiet advance mode seems to increase the shutter lag slightly, perhaps to further reduce the sound. The F6 is much quieter than the F100. It is significantly more quieter than the older generation cameras, such as the F3. The F3 with its motor drive makes a loud noise when winding film, like a gun firing. But the F6 film winding is nearly silent. The only sound is that of the mirror flapping and the shutter firing, just like the D300. The mirror slap still has the SLR type ker-chunk sound – as opposed to a rangefinder like Leica M6 which just goes click. The M6 shutter is quieter than the F6 at medium/high speeds. Slower speeds in the M6 make a whirring noise, typical of mechanical cameras. The manual winding of the M6 is actually louder than the automatic film winding (in silent mode) on the F6. The focusing screen F6 appears to be superior to those in other cameras like the F100 or the D300. Its focusing screen seems better designed for manual focusing; the focus plane transitions appear more clearly. This is confirmed by an article on the Zeiss website that states that the focusing screens in Nikon D2, D3 series and F6 are well suited for manual focusing. Here is a simple table comparing features that seem important to me. I think the F6 wins in every category except for viewfinder eyepoint, build quality (F5 may be slightly better) and removable finders (does anyone miss these?). Does not have color matrix metering. Yes (focusing screen seems significantly better than that of the F100).